This is a region-free 2-DVD-R set without case or artwork. With English narration; interview segments are in German, with English subtitles. 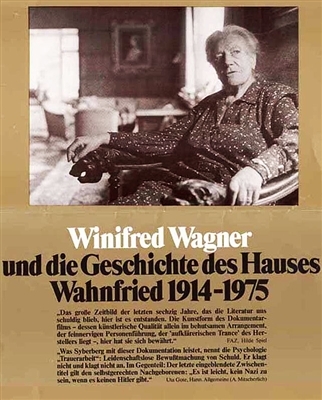 This fascinating 1975 documentary features five hours of interviews with Winfred Wagner, the daughter-in-law of composer Richard Wagner, and the magisterial director of the Bayreuth Festival of that composer's works for many years. Born an Englishwoman, she married Siegfried Wagner when he was in his '40s and she was 18. Long before he rose to power, she struck up an acquaintance and, finally, a friendship with Hitler, because he was an avid admirer of Wagner's works. For 30 years Wagner refused to talk of her 22-year relationship with der fuhrer. With this film, she breaks her silence and traces nearly 60 years of her life, a period in German-European history that saw the fall of the bourgeoisie. Completely apolitical, but very blunt and loyal, she avows that she is unqualified to judge Hitler's political legacy, and asserts that she speaks of him only as a loyal friend and cannot feel guilt for the criminal deeds of the man. I could find movies that I have been looking for years. A connection with history and music!